April 2, 2018 (Oakland, M D) – Garrett Regional Medical Center (GRMC) will join the growing network of 2,000 healthcare organizations across the nation that offer the DAISY Award program for Extraordinary Nurses®. The award program was created by the Daisy Foundation with the mission of recognizing the extraordinary, compassionate care that nurses provide patients and families every day. The DAISY Foundation is a not-for-profit organization established in memory of J. Patrick Barnes by members of his family. Patrick died at the age of 33 in late 1999 from complications of Idiopathic Thrombocytopenic Purpura (ITP), a little known but not uncommon auto-immune disease. (DAISY is an acronym for Diseases Attacking the Immune System.) The care Patrick and his family received from nurses while he was ill inspired this unique award that thanks nurses for making a profound difference in the lives of their patients and the patients’ families. Nurses may be nominated by patients, families and colleagues. Forms are available on GRMC’s website at https://www.grmc-wvumedicine.org. A selection committee at Garrett Regional Medical Center will honor an award recipient each quarter. The inaugural award ceremony for the DAISY award at GRMC will take place during the week of May 6, National Nurses Week. Honorees receive a certificate of commemoration as an “Extraordinary Nurse,” a DAISY Award pin and a sculpture that represents a healer’s touch. 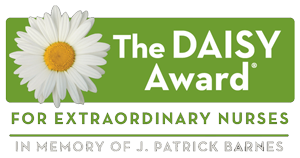 In addition to the DAISY Award, the DAISY Foundation offers J. Patrick Barnes Grants for Nursing Research and Evidence-Based Practice Projects gives the DAISY Faculty Award to honor inspiring faculty members in schools and colleges of nursing, and the DAISY In Training Award for nursing students. More information is available at http://DAISYfoundation.org.